No bestselling suspense novelist creates magnetic characters as consistently as Koontz does. In last year's Fear Nothing, this veteran author presented his most memorable figures yet: hero/narrator Christopher Snow, whose genetic affliction forces him to shun light; Chris's sidekick, the ultracool surfing dude Bobby; and ultrasmart dog Orson, a product of scientific experiments gone awry at Fort Wyvern in Chris's coastal California town. 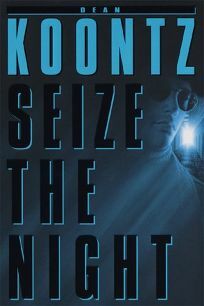 In this independent-minded sequel, the second novel of a trilogy, the wonderfully delineated loyalties among these characters and others will win readers' hearts as Koontz plunges his cast into terror. Koontz moves the trilogy's overarching plot in a wholly unexpected direction, pursuing not the experiments that begat Orson but a parallel time-travel/disruption experiment. The gambit feels a bit arbitrary, but it voids the attenuation that plagues many middle volumes. The story begins right after that of Fear Nothing, when Chris learns that children have been abducted to the Fort. Soon Orson is gone as well, but he's replaced smartly by Mungojerrie, the clever cat introduced in volume one. Set mostly at the abandoned Fort, as Chris and company search for the missing kids and dog, the novel proves supernally spooky (and, at times, surprisingly--deliberately--humorous). The suspense soars, culminating in a volcanic if somewhat confusing eruption of action climaxes. A principal villain makes a late appearance, but he's not as menacing as Fear Nothing's fiendish monkey troops, who also show up. Though not as seamlessly constructed as Fear Nothing, this novel stands as vintage Koontz, a rousing crowd-pleaser that recapitulates some of his recurrent themes--the pain of the outsider; the power of love; the threat of scientism--while sturdily continuing a trilogy that's shaping up as his masterwork. Simultaneous BDD audio. (Feb.; on sale 12/29). FYI: Bantam will release the mass market edition of Fear Nothing on December 1.